Uptown Wadesboro, Inc. (UWI) is a non-profit organization, currently an all-volunteer group, dedicated to improving the business climate and appearance of the Uptown Wadesboro business district. Working closely with the Anson County Chamber of Commerce, UWI is involved in many worthwhile projects that benefit the community. The UWI Board of Directors recognizes and appreciates the importance of an attractive and thriving downtown area to the overall economic health of the county. They know that a thriving downtown aids in the recruitment of businesses and industries, vacationers, retirees, and others seeking to relocate. Funding for UWI projects is derived solely from grants from private trusts and foundations and from UWI's fundraising activities and community projects. UWI's Board of Directors meets once a month at the Anson County Chamber of Commerce offices in the Scarborough Building at 107 E. Wade Street. The UWI Board meetings are normally the 1st Tuesday of each month at 4:00 pm in the Preston Burns Conference Room at the Chamber offices. Anyone is welcome to attend. Uptown Wadesboro, Inc. has several committees working on a number of issues including Publicity & Marketing to Fundraising, Special Events and Appearance. If you are interested in becoming involved in a committee or just volunteering to help with events on an occasional basis, please call the UWI office at 704-695-1644. Or you may send an email to uptownwadesboro@windstream.net. Thank you. Uptown Wadesboro, Inc. (UWI) works on a number of fundraising projects each year. Some of UWI's current projects are described below. Renovation Grants - One of UWI's most important contributions to the community are the renovation grants available to Uptown Wadesboro business owners. 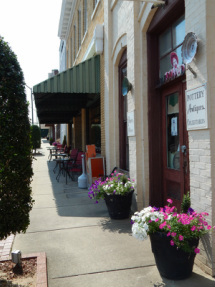 The Facade Grant program provides incentive grants to business property owners or tenants in the Uptown Wadesboro Business District to help with the costs of making exterior improvements to their properties. Applications are available at the UWI offices at the Chamber of Commerce offices at 107 E. Wade Street. For more details on the grant program, you may contact UWI at 704-695-1644 or see the Facade Grants page on this website. 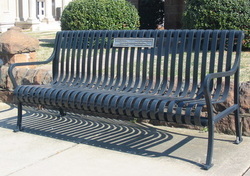 Commemorative Garden Benches - Metal benches placed throughout the Uptown Wadesboro area can be purchased with a commemorative placque. Brick Paver Program - Laser-engraved commemorative bricks can be purchased to honor family members, friends or to commemorate a loved one. Other examples of commemorative bricks include salutes to businesses, churches or associations. The bricks will be installed on the brick sidewalks of Uptown Wadesboro. In March 2007, the latest group of brick pavers was installed by the Town of Wadesboro on the sidewalks of Uptown Wadesboro. Application forms are available at the UWI offices at 107 E. Wade Street. For more information about the brick pavers, please call 704-695-1644. Uptown Wadesboro, Inc. presents free summer concerts on the streets of downtown Wadesboro. Local band or DJ provides music. Kids' activities. An information kiosk at the Town Square (northwest corner of Greene and Wade Streets in Uptown Wadesboro) was a joint project by Uptown Wadesboro, Inc. and the Town of Wadesboro. The kiosk displays community-related announcements (for example, fund-raising BBQ’s and luncheons by local non-profit groups and churches). UWI developed this project at the invitation of the Town Manager and received permission to use the corner from the property owner. Funding for this project was provided by the Town of Wadesboro. David Rice of the Town Public Works Department constructed the sign working from a design by Merrie Datin. Guidelines for use of the new kiosk are set by the Town. Any questions regarding the use of the kiosk should be directed to the Town offices.